Three day search for 5 thousand missing Rescue teams will continue search operations for the missing until next October 11th. The government has announced that it will declare destroyed Palu areas "mass graves" and leave them "intact". There are 200,000 people in desperate need. Food and clean water are scarce and many of the 70,000 displaced people still depend on aid. More than 82 thousand military and civilians, in addition to volunteers, assist the survivors on the ground, while the army helicopters reach the remote areas. 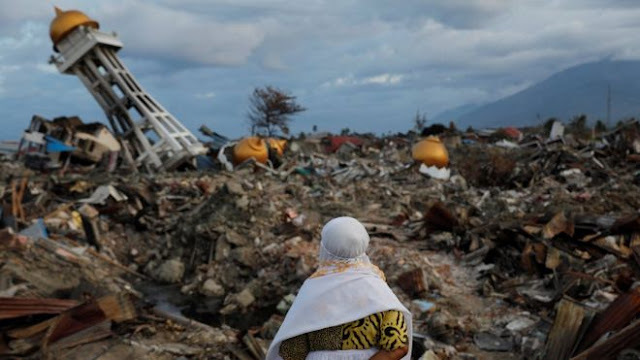 Jakarta (AsiaNews) - There are almost 2,000 bodies of victims found in Palu, a city where entire neighborhoods have been wiped out by the earthquake and tsunami that struck on the island of Sulawesi last September 28. Authorities report the toll could worsen again: there are 5 thousand missing, overwhelmed by landslides and mud avalanches, in the towns of Balaroa and Petobo (south of Palu). M. Tohir, spokesman for the Indonesian Armed Forces, said today that the death toll from the disaster increased to 1,944. The National Disaster Management Agency (BNPB) declares that rescue teams will continue the search for missing persons until next October 11, when they will become "presumed dead". The government has announced that it will declare the destroyed areas of Palu "mass graves" and leave them "intact". Rescue efforts have increased to assist 200,000 people in dire need. Food and clean water are scarce and many of the 70,000 displaced people still depend on aid, after days of delays. The day after the disaster, several incidents of mass looting took place in the epicenter of the emergency, while humanitarian convoys struggled to reach the population. Thanks also to international aid, in the last days operations are progressing more quickly. Airplanes full of supplies are landing with increasing frequency in Palu, where the military unload the materials onto trucks or helicopters. More than 82 thousand soldiers and civilians, in addition to volunteers, are assisting the survivors on the ground, while the army helicopters are reaching the remote areas blocked by the disaster.